Cheese blintz, if you’re not familiar are farmer’s cheese- and mascarpone-filled crêpes that you’ll burrito-wrap and fry in butter. Breakfast insanity! This is a tough post to write. 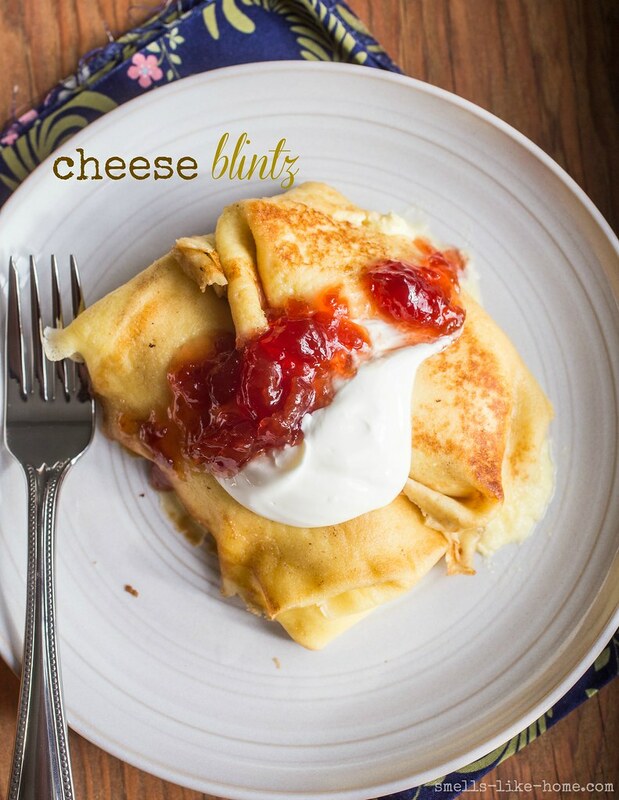 Partially because I’m having trouble describing how much you need these cheese blintz in your life. And partially because my experience with these blintz was pretty bittersweet. I’ve written, erased, and rewritten this post 3 times now and I’m finally ready to be happy with it. I’m going to go out on a limb – and please, correct me if I’m wrong – but I feel like cheese blintz are a highly regionalized dish in the U.S. They’re a staple in many Jewish homes around the Jewish holidays, a culture of which I’m fairly familiar, having grown up on Long Island, and not far from NYC. I’ve seen blintz on lots of restaurant menus – most especially diner menus – and because they’re easy to make in large batches, they’re pretty popular at brunch buffets too (even on Easter and Mother’s Day). They’re one of what I call the Jewish comfort food trifecta: chicken noodle soup, knish, and cheese blintz. You’ll find them all on loads of Jewish deli menus and again, in most NY diners. This is where the post gets tough for me. This past Christmas was my family’s first without my dad. I hope you don’t feel like I keep rambling on about this but all the people who told me that the “firsts” of everything that happen after you lose a parent – or any loved one – are always the hardest, were so, so right. I talked about my first birthday without dad a few months ago. His birthday was earlier this month and rather than spending the day in bed, which I truly considered doing, I opted to spend the day with family instead which helped ease the pain a little. But as expected, the whole Christmas season was brutal. 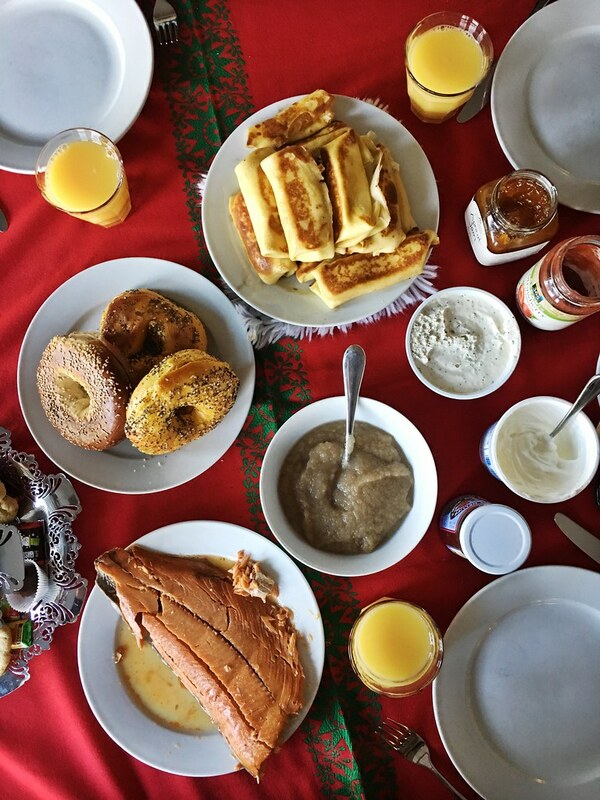 So, to add a bit of comfort to our post-Christmas brunch, for which my bro offered to bring fresh NY bagels and mom toted along some smoked salmon (be still my heart!) like a good New Yorker does, I decided to make these cheese blintz since I know my mom loves blintz. I considered making latkes as well, but I may have imbibed too much on Christmas night be able to pull off the latkes on the morning after. Ah well. The blintz turned out spectacularly though, even if I did fumble through making the filling and ultra thin crêpe wrappers that morning. The filling is a thick, sweet, slightly lemony cheese, made with farmer’s cheese – if you can find it otherwise, ricotta will do – eggs, a little lemon zest, vanilla, and mascarpone. 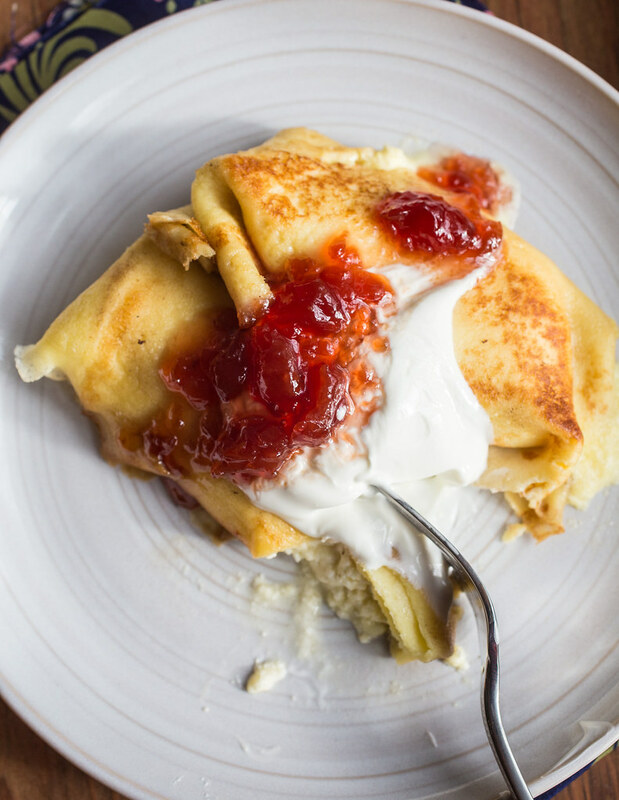 Wrapped up in the crêpes like little burritos, you’ll then pan-fry the blintz in butter. And if that butter just happens to brown a little while you’re frying away, as you’re paying more attention to your mimosa than the frying pan, then so be it. Top with some sour cream and preserves, if you wish, and devour. This meal was just what we needed and I know dad would have loved it too. 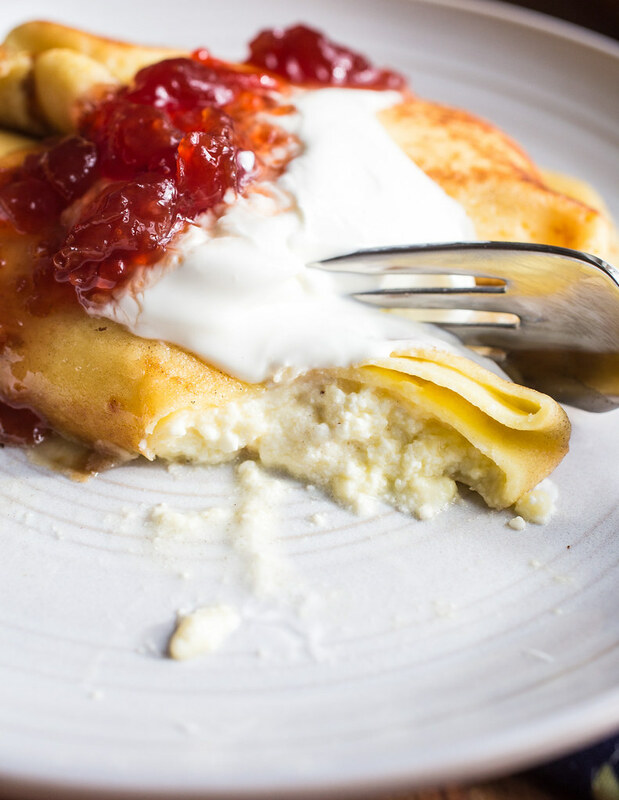 The filling for these blintz is pretty versatile. If you’re going for a sweeter blintz, add a little more sugar and the vanilla. I used a thick farmer’s cheese (as opposed to a looser ricotta) and my filling was still a little loose. I probably could have refrigerated it a bit longer – you can do so for up to 2 days in advance – and I used two egg yolks which didn’t help to thicken the filling but did make it really rich. Next time I’ll use a whole egg instead. Make ahead: The filling can be made up to 2 days in advance and the crêpe batter, 1 day. You can also make the whole recipe up until you fry them. Stick them in the freezer on a baking sheet to freeze individually and then toss the frozen blintz in a zip-top bag and freeze for up to 1 month. Thaw completely in the fridge and fry in butter before serving. To make the crêpe wrapper batter: Blend 4 tbsp butter and all of the other ingredients in a blender until completely smooth. Cover and refrigerate for at least 1 hour or up to 2 days. To make the filling: Whisk all of the filling ingredients together in a medium bowl. Cover and refrigerate for 1-2 hours. To make the crêpe wrappers: Heat a medium (8- to 9-inch) nonstick frying pan over medium heat. Brush the pan with some of the remaining melted butter. Pour in ¼ cup of the batter (if it’s super thick, thin it out with a little more milk) and swirl the batter around the bottom of the pan to cover it completely. Cook until the edges just start to turn a light golden brown, and then start to shimmy a thin, flexible spatula – either a regular, fish, or offset – under the crêpe to loosen it. Once it can freely move around the pan without sticking, flip it over and cook for another 20 seconds or so. The first one might be “test” version so don’t worry if it turns out wonky – this will get easier as you continue. Cook the rest of the batter in the same manner, stacking the cooked crêpes on a plate as you go. To assemble and finish: Add about 3 tablespoons of the filling to each crepe and wrap them up burrito-style (fold the sides towards the center and roll up from the side closest to you). Melt 2 tablespoons of butter in a large cast iron or nonstick skillet over medium heat. 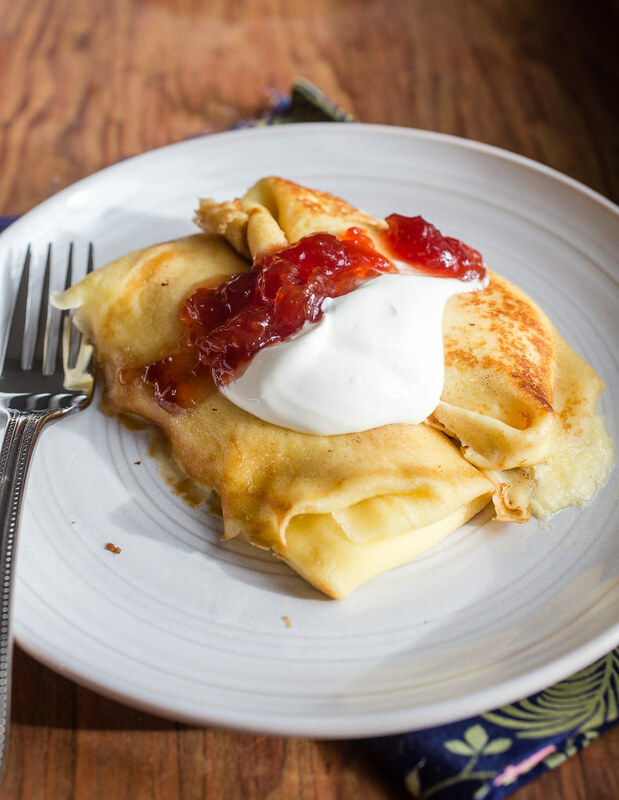 Working in batches, arrange a few blintz in the pan – don’t overcrowd the pan. Fry for a couple of minutes on tops and bottoms, just until they are a bit brown and heated through. Serve while still warm with sour cream and jam/preserves.